Half a million breast cancer deaths averted! That’s certainly a headline that will get attention. A study just published in Cancer concluded that approximately 500 million deaths from breast cancer among women in the United States (US) have been averted over the past 30 years due to screening mammography and improved therapy. The most important point to understand about this study is that it did NOT look at every woman who was diagnosed with breast cancer since 1989 and tabulate deaths in these women – there is no such repository of data that captures every single diagnosis and death from cancer. The study was based on database analysis as well as modeling and extrapolation. This study utilized data from the National Cancer Institute’s Surveillance Epidemiology End Results (SEER) program – which collects data on cancer diagnosis, treatment and survival for approximately 30% of the US population. Different states and counties have been added over the years to help ensure that the database reflects the racial, ethnic and socioeconomic diversity of the US. Data points are added to reflect current scientific knowledge and changes to staging systems. Current year reported numbers are estimates, as data entry and analysis lags several years. This article provides a history of the program and discusses some of the limitations. For this study, the authors analyzed breast cancer mortality data from 1989 for women age 40-84. They concluded that cumulative breast cancer deaths averted over the past 30 years ranged from 384,000 – 614,500. The most recent data in the SEER registry for US breast cancer incidence and deaths extends through 2015. Therefore, information from 2016 – 2018 is based on estimates and projections. They utilized 4 different models to estimate “background breast cancer mortality rates” – the likelihood of death from breast cancer without screening mammography or modern therapy. 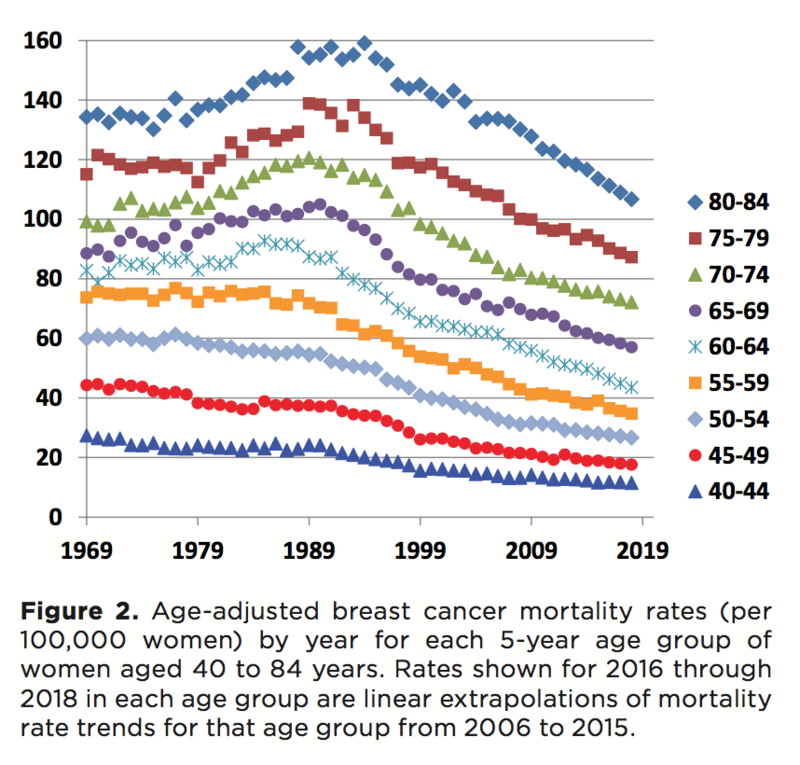 These 4 models use different assumptions about breast cancer mortality rates based on trends prior to 1989, resulting in a range in the estimated number of lives saved. The authors combined this information with US population data obtained from census reports and estimates. The authors noted that they made no attempt to separate out the effect of screening mammography versus treatment, and also noted that the SEER database did not include information on whether newly diagnosed breast cancer patients had undergone a mammogram within 1-2 years of diagnosis. In addition, they commented that only about 50% of women age 40 and over in the US undergo screening mammography every or every other year. One of the authors, Dr. Hendrick, commented in the press release that accompanied the article that “The best possible long-term effect of our findings would be to help women recognize that early detection and modern, personalized breast cancer treatment saves lives and to encourage more women to get screened annually starting at age 40.” [emphasis mine] However, as the authors did not separate out the effect of screening mammography versus modern therapy on breast cancer mortality, the highlighted part of his conclusion does not seem to be supported by the results of this study. Studies such as these often raise more questions than they answer. 500,000 lives saved over 30 years sounds like tremendous progress – but we know that in the US, approximately 40,000 women and 2500 men die every year due to metastatic breast cancer. A lot of the disconnect is that studies like these often report death rates, usually per 100,000 people, not absolute numbers. Treatments have improved, and screening mammography has made a difference. But as the US population is growing and aging (and the likelihood of breast cancer increases with age) there may be more individuals with breast cancer. Cancer incidence also increases with increased use of screening mammography (due to increased detection), but not all of these cancers are lethal. Rates of death from breast cancer decrease, but absolute numbers may not. I bring up these last points not to put a damper on some of the glowing headlines regarding this study, but to ensure that we don’t lose focus regarding the work to be done. Approximately 40,000 women and 2500 men will die this year due to metastatic breast cancer. We’ve made tremendous progress, but it’s not time to celebrate just yet.